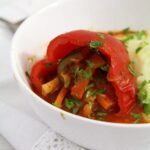 An easy and healthy vegan stuffed peppers recipe without rice, just peppers filled with vegetables and simmered in tomato sauce. 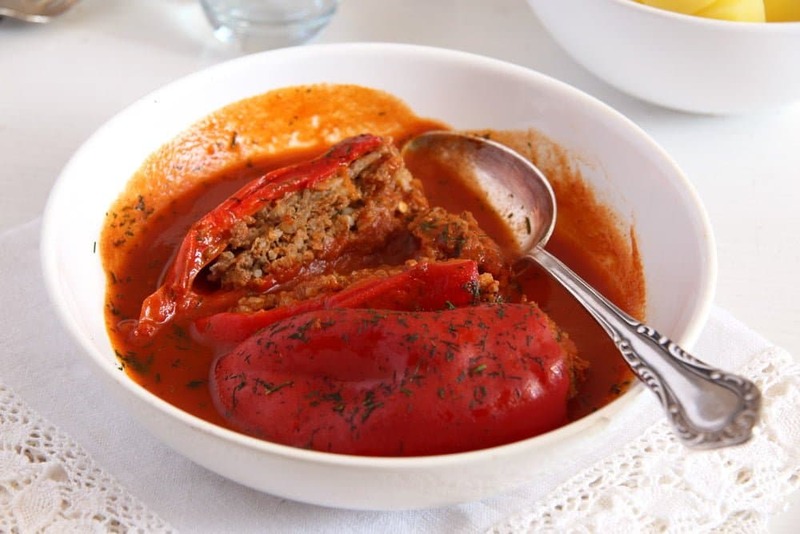 Have a look at these Stuffed Peppers with Feta for instance or these Stuffed Peppers with Mince! Who can resist? I know I can’t! I don’t know how it came that peppers became one of my favorite vegetables, except tomatoes they are the one veggie that I always have in the house, I eat them raw every day, I put them in just about anything, I cooked them in more different ways than any other vegetable probably. And they used to be the most hated vegetable for me as a kid. I have always eaten them raw, but cooked peppers were evil for me back them, probably the way that mushrooms are a thing from the devil for my kids nowadays. My grandmother always took care to leave the peppers in large chunks in any dish she made using them. Otherwise, if the pieces were too small, I would not have been able to pick them out entirely and then I would refuse to eat anything anymore… 🙂 Children! 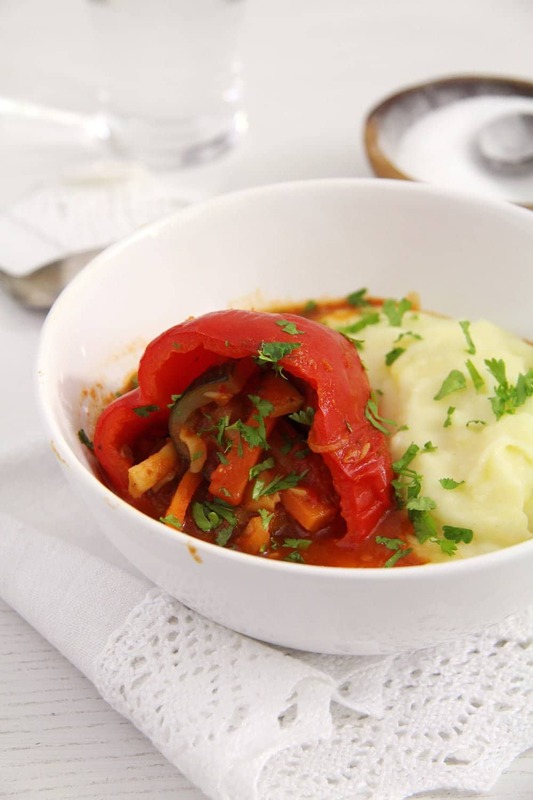 And back to today’s recipe: this vegan stuffed peppers recipe is just amazing! I am so sure anybody would like these stuffed peppers, either vegans, vegetarians or meat lovers. Even if you normally like your peppers stuffed with meat, trust me, you will not miss the meat in this case. There is so much flavor involved, so much comfort due to that delicious tomato sauce and if you add the mashed potatoes (please do) you will make anybody happy. I used my homemade tomato sauce to make the sauce for the vegetarian stuffed pepper recipe, but you can use any kind of tomato sauce you like. I usually take the listed vegetables to fill the peppers, but you can experiment there as well, take what you like best and what is in season. As mentioned above, this is a vegetarian or vegan stuffed peppers recipe without rice. So, if you are eating low carb this is the recipe for you, no rice or any other grains, just bell peppers stuffed with some more veggies. 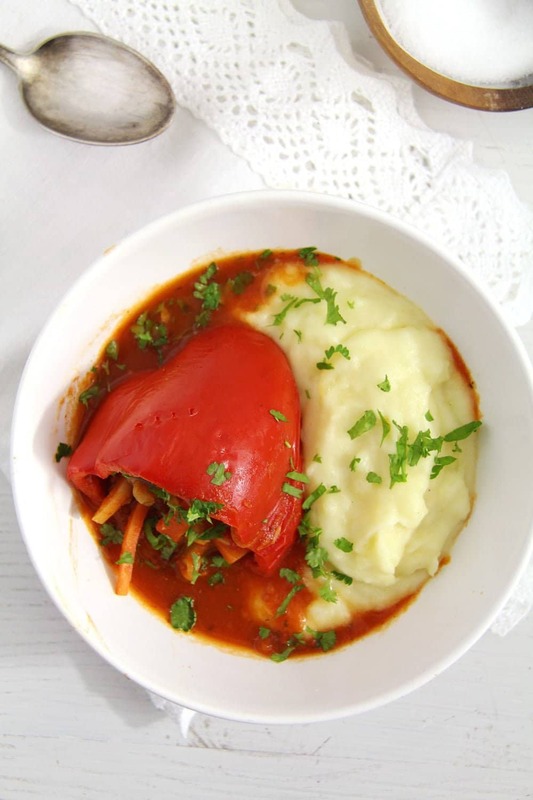 But, as I am not so much into low carb myself, I always serve these healthy stuffed peppers with mashed potatoes. 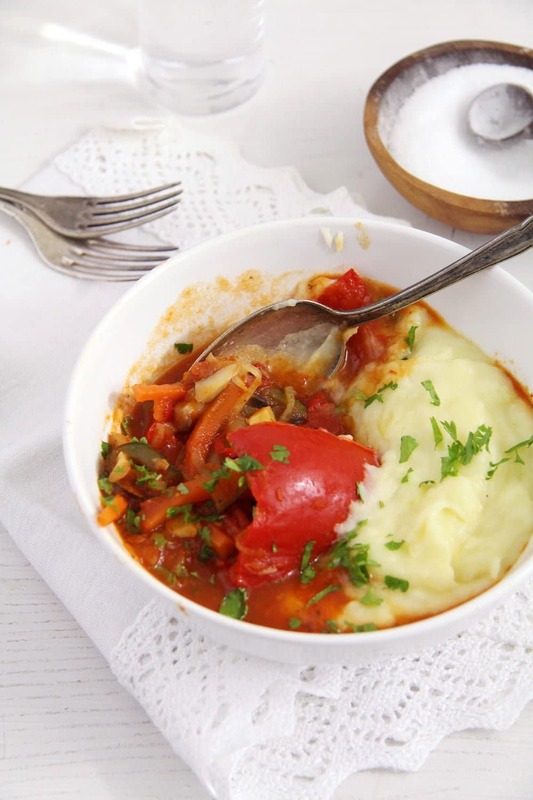 The combination of those flavorful vegetable stuffed peppers, tomato sauce and mashed potatoes is just heavenly! Step 1: Make the tomato sauce. 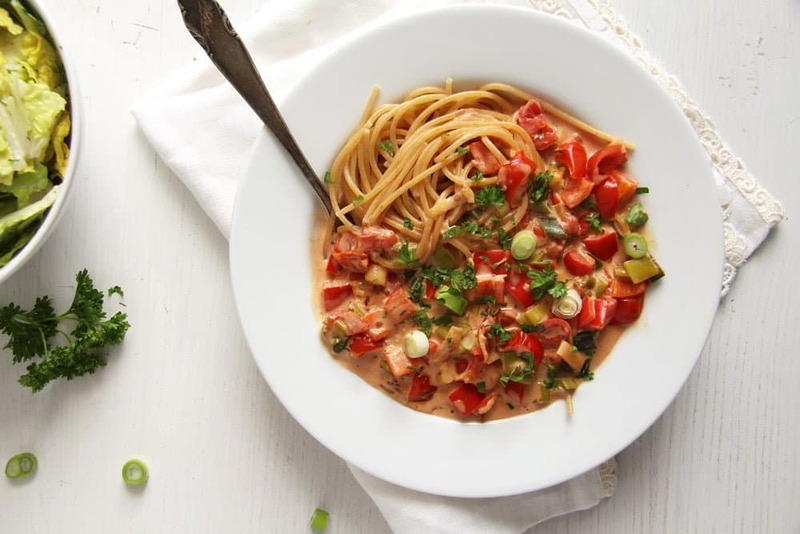 It can be made in advance, it keeps well for several days in the fridge. Step 2: Prepare the bell peppers. I normally take red bell peppers when making a stuffed peppers recipe, they are the sweetest one. Yellow are fine as well, but I would not use green bell peppers, I find them too bitter in such large quantities. Cut the top of the peppers and carefully remove the seeds. Bring a large pot of water to a boil, add a little salt and cook the peppers for 2 minutes. Drain well. Step 3: Prepare the vegetables. Cut the carrot and the zucchini into thin sticks and slice the mushrooms and the onion. Step 4: Cook the vegetables in a little olive oil for about 7-8 or until most of the liquid released by the mushrooms is gone. Add salt and pepper to taste. Fill the peppers with the vegetable filling. Step 5: Pour the tomato sauce and vegetable broth in a pot large enough to hold the peppers. Bring to a simmer, add the tomato paste, more salt and pepper if necessary. Arrange the stuffed peppers in the sauce and simmer, covered, for about 20 minutes, turning halfway through. The stuffed peppers should become soft but not mushy. Remove the lid from the pot and cook the peppers for 5 minutes more, allowing the sauce to thicken a bit as well. Sprinkle with lots of fresh parsley and serve with mashed potatoes. until smooth. Vegan stuffed peppers: Cut the top of the peppers and carefully remove the seeds. Bring a large pot of water to a boil, add a little salt and cook the peppers for 2 minutes. Drain well. Clean the vegetables. Cut the carrot and the zucchini into thin sticks and thinly slice the mushrooms and the onion. Heat the oil in a large pan, add the vegetables, sprinkle them with the sugar and cook them, stirring often, for about 7-8 minutes or until most of the liquid released by the mushrooms is gone. Add salt and pepper to taste. Fill the peppers with the vegetable filling. Pour the tomato sauce and vegetable broth in a pot large enough to hold the peppers. Bring to a simmer and whisk in the tomato paste. Add more salt and pepper if necessary, then place the peppers in the sauce. Cover, turn the heat down to low and cook the peppers, turning on the other side after half of the cooking time, for about 20 minutes or until soft but not mushy. Remove the lid from the pot and cook the peppers for 5 minutes more, allowing the sauce to thicken slightly. Sprinkle with lots of fresh parsley and serve with mashed potatoes (not vegan, if cooked with milk and butter). 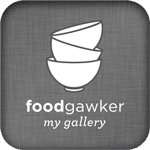 Plain boiled potatoes, rice, quinoa, buckwheat, couscous, bulgur or polenta would make great vegan sides as well. Ahaa. Very good tip: boil pepper before baking. I bake them ca 45 minutes and these are still not soft. Great tip to parboil the peppers first! I love peppers too. These look so delicious Adina. My kids think the same thing about mushrooms that yours do. And I so LOVE mushrooms. Have a beautiful week my friend! They look fantastic served with creamy mashed potatoes!! We eat lots of peppers, but mostly raw because hubby doesn’t eat cooked veggies, not even filled with his favourite ground meat. These stuffed peppers are very different and vibrant and delicious looking.. I am gonna try this for sure..